Preliminary evidence supports a possible association between post-traumatic stress disorder (PTSD) and sensory modulation disorder (SMD). Nevertheless, the research focusing on this relationship in children is notably limited. This study examined children with and without PTS symptoms, by comparing their mothers’ perceptions of their responses to sensory events in daily life. Mothers of 134 non-referred children aged 5–11, exposed to continuous traumatic stress due to political violence, completed the UCLA-RI and the Short Sensory Profile questionnaires. Significant differences emerged between children with different levels of PTS symptoms in various sensory modalities. Furthermore, half of the symptomatic children had suspected clinically significant deficits in sensory processing. In addition, PTSD symptoms were significantly associated with most of the sensory processing scores. Logistic regression indicated that the overall sensory processing score was a significant predictor of group classification. The results indicate that children with PTS symptoms may be at increased risk for sensory processing deficits. Evaluation of sensory processing should be incorporated into the routine evaluation of this population in order to determine whether this is an additional factor contributing to a child’s difficulties in participating in daily activities. Subsequent intervention programs should then address the multiple needs of these children. This study was supported by a grant from the Israel Science Foundation (ISF) to Ruth. Pat-Horenczyk, Principal investigator. We are grateful to the Bernard van Leer Foundation and Herbert Bearman Foundation for their generous support of the study and the treatment of the traumatized families. All procedures followed were in accordance with the ethical standards of the responsible committee on human experimentation [institutional and national] and with the Helsinki Declaration of 1975, as revised in 2000. Informed consent was obtained from all patients for being included in the study. Pat-Horenczyk, R. (2004). Post-traumatic distress in Israeli adolescents exposed to ongoing terrorism: Selected findings from school-based screenings in Jerusalem and nearby settlements. Journal of Aggression, Maltreatment & Trauma, 9(3–4), 335–347. https://doi.org/10.1300/J146v09n03_04. Pat-Horenczyk, R., Cohen, S., Ziv, Y., Achituv, M., Brickman, S., Blanchard, T., & Brom, D. (2017). 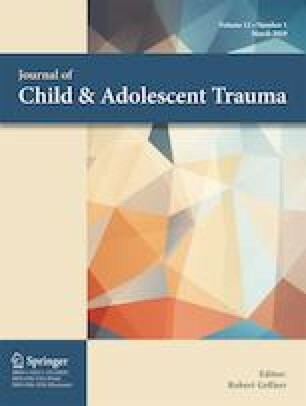 Stability and change in posttraumatic distress: A 7-year follow-up study of mothers and young children exposed to cumulative trauma. Journal of Traumatic Stress, 30(2). https://doi.org/10.1002/jts.22177. Torchalla, I., Killoran, J., Fisher, D., & Bahen, M. (2018). Trauma- focused treatment for individuals with posttraumatic stress disorder: The role of occupational therapy. Occupational Therapy in Mental Health, 1–21. https://doi.org/10.1080/0164212X.2018.1510800.